When I first opened these two samples, I thought perhaps the package labels had been accidentally switched. So I checked the Canton Tea Co website and sure enough, they had been labeled correctly. So my previous experiences of Tie Guan Yin oolong leaves as being long and dark versus Pouchong leaves being tightly rolled have essentially been turned on their head. But I have no complaints, because I thoroughly enjoyed both of these teas. The Tie Guan Yin is listed on the Canton website as an “everyday” type of tea, and indeed it would be a great pleasure to drink this tea daily. The leaves — ranging in colour from dark to medium greyish greens — are lightly rolled, and smooth to the touch. I placed about half of the ten-gram sample into my favourite oolong-designated clay (Yixing) teapot, which had been prepared by rinsing with hot tap water. As usual, the filtered steeping water was brought just to a full boil, then cooled to “fish eye” temperature. Initial meeting of leaf and water for the preparatory rinse educed the scent of a summer meadow, as the smell of sweet buttercups, new grass, and sprouting shrubs would be carried on a warm breeze. I know that kind of poetic analogy may sound silly, but this is the only way I can accurately describe the aroma. The initial sip was warm and almost sweet. A few more sips evoked the taste of the fresh spring asparagus with buttery toasted pecans that a friend had served to us a few weeks ago — an indescribable vegetable flavour that is like no other, paired with the sweet pecan nuttiness. As an added bonus, there was an actual buttery or light creamy texture in the cup. At one time, at the beginning of my tea journey, I had been puzzled when anyone described a tea without added milk as having a creamy texture. It’s just leaf and water, I thought, so how could that possibly be? I don’t know the science, but I do know the result, and once you sample a tea with this innate quality, you will never forget it. Luckily, it seems that more creamy-textured teas are reaching the market, so it’s a little easier to source a tea, like this one, with this quality, and experience it for yourself. 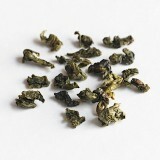 The rather long finish of this tea is the more floral notes associated with Tie Guan Yin. All in all, a very enjoyable cup. Some tea drinkers classify Pouchong as a green tea, but I’m happy to see this most lightly oxidized of teas listed with Canton’s oolongs. 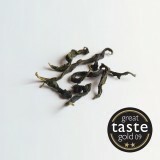 Dark leaves, long and thin, are frankly not what I expected in its appearance, but the taste and aroma are all there. Prepared by the same method as the Tie Guan Yin — or perhaps just slightly cooler water — this high-grown pouchong produces an elegant and aromatic cup. Pale golden green, like a cat’s eye, in my small glass tasting cup. Aroma is gently floral, more like fragile spring blossom than full summer bloom. A hint of nectar scent carries into the taste. Although nowhere near the creamy texture of the Tie Guan Yin, this tea nonetheless leaves a light floral finish that lingers on the tongue. The Canton website notes that this tea won a gold taste award. I can see why. I browsed through the Canton website and discovered that along with a good selection of teas and interesting tea ware, there is a lot of well-researched information in their “tea school” — along with some terrific photos. I have a feeling I’ll be back soon. Follow us on Twitter and join our Twibe! Contact us about reviewing your tea-related product or service. I enjoy giving “gift basket” gifts. By this I mean that instead of giving one single item as a gift, I assemble a group of related smaller gifts, although I don’t always wrap them in an actual basket. For example, a Tea Time gift that we gave recently included a teapot with built-in filter, matching tea cozy, four small tins of loose-leaf tea, decorated sugar cubes, a package of scone mix, and a jar of jam, all packed in a pretty box. A Movie Time gift comprised a tote bag filled with popcorn, other assorted munchies, and of course several classic DVD films. Whenever possible when putting together these basket gifts, I like to tuck in a related book. For the New Puppy gift of double bowl, a leash, treats, a photo frame, and a play ball, we added a book on dog training. Recently I came across several unusual books that I think would be perfect as part of a tea basket gift. I particularly like these because, although they are not the usual books you find in every store, I think recipients will enjoy reading them as they sip their cuppas. 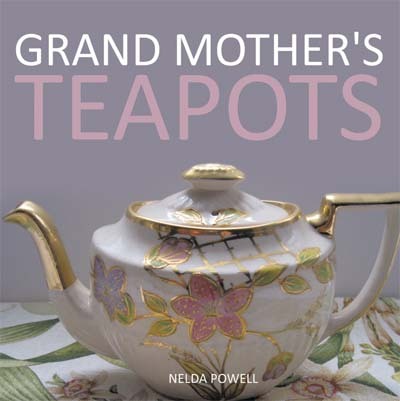 Grand Mother’s Teapots by Nelda Powell is the largest in size of the bunch, although its paperback format makes it easy to slip into a gift basket or box. If you enjoy collecting — or just looking at — unusual teapots, this book illustrating one woman’s lifetime collection is for you. The collection is described by the author as “the pride of Georgia Mae Gasperson Wright.” Seventy pages of beautiful photographs lovingly showcase hundreds of teapots of every shape, size, and origin, from the easily-recognizable and commonplace to the highly unusual. Many of these were mementos of her children’s worldwide travels. Amongst the multitude of styles, I have to admit to a special fondness for her several stacked tea sets of teapot, sugar, and creamer. Given the number of these sets in the collection, I imagine she enjoyed them too. This book is not only a celebration of a seemingly unlimited variety of teapots and the imaginative souls who created them, but of the special lady who cherished them — and who was, in turn, so very cherished by her grandchildren. Grand Mother’s Teapots is available direct from the author, and at nationwide bookstores. Brenda Williams may be living the sunbird’s life in Arizona these days, but you’d better believe that she’s British through and through. A former tea room owner, Brenda offers teas, accessories, British gourmet treats, and tea party packages for adults and children via her current business, Brenda’s English Teas. 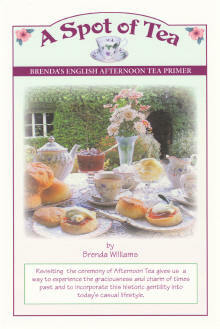 She is also the author of the next gift basket book on my list: A Spot of Tea ~ Brenda’s Afternoon Tea Primer. This delightful little book clearly and concisely tells you everything you need to know to serve or partake of this most English of tea rituals. Each of the 25 pages is packed with etiquette, tips, and how-to’s, from preparing a proper pot of English tea and the required equipage, to how to hold a teacup and how to stir your tea (yes, there is a correct way to do each of these!). You’ll also find an outline of the basic types of teas, as well as the origins of tea and of afternoon tea itself. Brenda provides an afternoon tea menu and recipes for an array of tempting teatime tidbits. A Spot of Tea is available direct from the author’s website. I picked up the next two little tea books — gift basket books — last weekend when we visited Biltmore Estate for our fifteenth wedding anniversary. They were stocked in the Confectionery shop along with several types of packaged teas (most notably a selection from the not-so-distant Bigelow tea estate), a few teapots, mugs, and teaspoons, and some very yummy tea-flavoured hard candies. A Dish of Tea came about, according to the introduction, “from a program on tea, coffee, and chocolate” presented by staff at Conner Prairie Museum in Indiana. Its thirty pages describe customs, etiquette, and table settings as they were practiced in nineteenth-century America. There are scads of teatime recipes gathered from nineteenth-century cookbooks, including Mrs. Beeton’s and the White House’s. You’ll find sweets and savouries of all types within this little book’s pages, with each recipe more tempting than the last. A Dish of Tea is one of a series of small books on a variety of historical “house and garden” titles. They are sold in gift shops and farm markets. If you can’t find this title locally, visit the publisher’s website, Bear Wallow Books, for links to online sellers. Book cover photo courtesy of Copper Beech Publishing. The final title on my gift-basket book list is Tea & Conversation. As you might guess, the focus of these sixty pages is what many consider a lost art: pleasant conversation, otherwise known as “small talk.” Now, don’t dismiss this out of hand. In these days, when so many people feel a need to get right to the “nitty gritty” in any situation, and are only too eager to speak their minds regardless of the consequences, this book is both a guide and a gentle plea for civilized social discourse. Along with timeless admonishments and advice to the hostess for making her guests feel welcome and comfortable, there are also guidelines for guests on what types of conversations and behaviours to avoid at an afternoon tea gathering. Crowing about one’s accomplishments, or the accomplishments of one’s children, and loud voice or boisterous behaviour are all on the taboo list. While some of the suggested topics for conversation may seem outdated, most really do still apply today in polite circles. One timely piece of advice, for example, is directed at young gentlemen: “Never lower the intellectual standard of your conversation in addressing ladies.” Now who can argue with that? 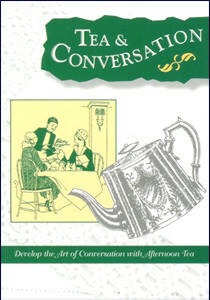 Tea and Conversation is also one of a series of tiny books that also features several other tea titles. Published in Great Britain, you can browse their catalogue and purchase (retail and wholesale) at Copper Beech Publishing.